The chromosomal location of CUL-5 (11q 22-23) is associated with LOH in breast cancer, suggesting that CUL-5 may be a tumor suppressor. The purpose of this research was to determine if there is differential expression of CUL-5 in breast epithelial cells versus breast cancer cell lines, and normal human tissues versus human tumors. The expression of CUL-5 in breast epithelial cells (HMEC, MCF-10A), and breast cancer cells (MCF-7, MDA-MB-231) was examined using RT-PCR, Northern blot analysis, and Western blot analysis. The expression of mRNA for other CUL family members (CUL-1, -2, -3, -4A, and -4B) in these cells was evaluated by RT-PCR. A normal human tissue expression array and a cancer profiling array were used to examine CUL-5 expression in normal human tissues and matched normal tissues versus tumor tissues, respectively. CUL-5 is expressed at the mRNA and protein levels by breast epithelial cells (HMEC, MCF-10A) and breast cancer cells (MCF-7, MDA-MB-231). These cells also express mRNA for other CUL family members. The normal human tissue expression array revealed that CUL-5 is widely expressed. The cancer profiling array revealed that 82% (41/50) of the breast cancers demonstrated a decrease in CUL-5 expression versus the matched normal tissue. For the 50 cases of matched breast tissue there was a statistically significant ~2.2 fold decreased expression of CUL-5 in tumor tissue versus normal tissue (P < 0.0001). 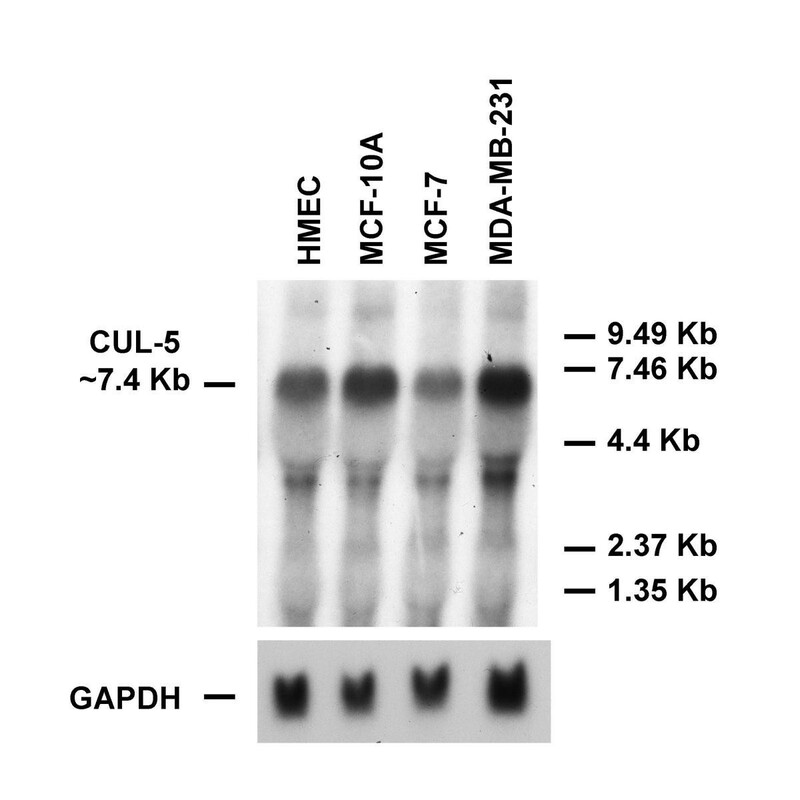 The data demonstrate no apparent decrease in CUL-5 expression in the breast cancer cell lines (MCF-7, MDA-MB-231) versus the breast epithelial cells (HMEC, MCF-10A). The decrease in CUL-5 expression in breast tumor tissue versus matched normal tissue supports the hypothesis that decreased expression of CUL-5 may play a role in breast tumorigenesis. The chromosomal region 11q22-23 is associated with LOH in breast cancer [1–8], suggesting that a gene or genes at this chromosomal region may play a role as a tumor suppressor. One study demonstrated that frequency of LOH at 11q22-23 is 38% in primary breast tumors and 84% in local recurrences after surgery . One candidate gene located at this chromosomal region is CUL-5 [7, 8]. CUL-5, first described as a gene product involved in mediating vasopressin-induced increases of intracellular-free calcium in renal medullary epithelial cells , belongs to an evolutionarily conserved gene family named the Cullins (CULs) [10, 11]. To date, seven mammalian CULs have been identified and designated CUL-1, CUL-2, CUL-3, CUL-4A, CUL-4B, CUL-5, and CUL-7 [10–13]. CUL proteins appear to function as scaffolding proteins within E3 ubiquitin ligase complexes , which assist in targeting protein substrates for ubiquitin-mediated degradation by the 26S proteasome [15, 16]. The mechanism of targeted degradation consists of three enzymatic steps [15, 16]. In step one, an E1 enzyme activates the 76-amino acid protein ubiquitin to a high-energy thiol ester intermediate. In step two, E2 enzyme, referred to as an ubiquitin-conjugating enzyme, assists in the transfer of the activated ubiquitin to a lysine residue on the substrate protein that is bound to the E3 ubiquitin ligase complex. Finally, the substrate protein is polyubiquitinated with a chain a ubiquitins, which is the signal for it to be recognized and degraded by the 26S proteasome. The CUL-based E3 ubiquitin ligases consist of a CUL protein, a RING finger protein (e.g. ROC1/Rbx1, ROC2), an E2 ubiquitin-conjugating enzyme (e.g. Cdc34, Ubc5), an adaptor (e.g. SKP-1, Elongin C), and a substrate recognition protein (e.g. F-box proteins, BC-box proteins) [15, 16]. CUL proteins function in E3 ubiquitin ligase complexes as scaffolds that bring together the ubiquitin conjugating and substrate recognition components of these E3 complexes. CUL-5 has been suggested to be a tumor suppressor in breast tissue despite a lack of information concerning the expression and function of this gene during breast tumorigenesis. The main purpose of this study was to examine the expression of CUL-5 in breast epithelial cells versus breast cancer cell lines and in normal tissues versus matched tumor tissues. Here, we report that MCF-7 and MDA-MB-231 breast cancer cell lines do not demonstrate an apparent decrease in the expression of CUL-5 mRNA or protein when compared to HMEC and MCF-10A breast epithelial cells. However, analysis of 50 cases of matched normal versus breast tumor tissue revealed a statistically significant ~2.2 fold decrease in CUL-5 expression in the tumor tissue versus the matched normal tissue. As shown in Figure 1A, RT-PCR demonstrated that CUL-5 mRNA is expressed by primary HMECs, immortalized but non-tumorigenic MCF-10A cells, and both ER-α positive (MCF-7) and ER-α negative (MDA-MB-231) human breast cancer cell lines, as evidenced by amplification of the predicted 674-bp PCR product. The 674-bp CUL-5 PCR product was not evident in the NT controls (Figure 1A) or when reverse transcriptase was eliminated from the reaction mixture (data not shown). 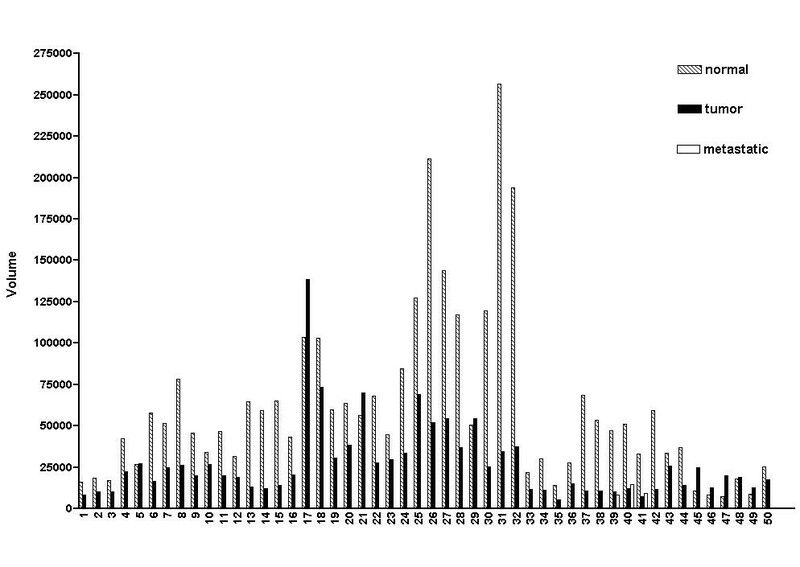 The integrity of the RNA samples was confirmed by amplifying a 411-bp PCR product for ribosomal protein S9 (Figure 1B). The identity of the CUL-5 PCR products from these cells were confirmed by restriction endonuclease digestion with EcoR I, which resulted in the generation of two smaller DNA fragments of the predicted sizes (Table 1 and Figure 1C), and by DNA sequencing (data not shown). Expression of mRNAs for other CUL family members in these same cells was demonstrated by RT-PCR amplification of cDNAs for CUL-1, -2, -3, -4A, and -4B (Figure 2). PCR products for these other CUL family members were not amplified when reverse transcriptase was not included in the reaction mixture (data not shown). PCR products for CUL-1, -2, -3, -4A, and -4B were confirmed by restriction endonuclease digestion with Bgl II, Aat II, EcoR I, Sau3A I and Hae III, respectively (data not shown). The RT-PCR results for CUL-5 mRNA expression were confirmed by Northern blot analysis, which demonstrated one major transcript of ~7.4 kb and two minor transcripts were observed below the 4.4 kb marker (Figure 3). 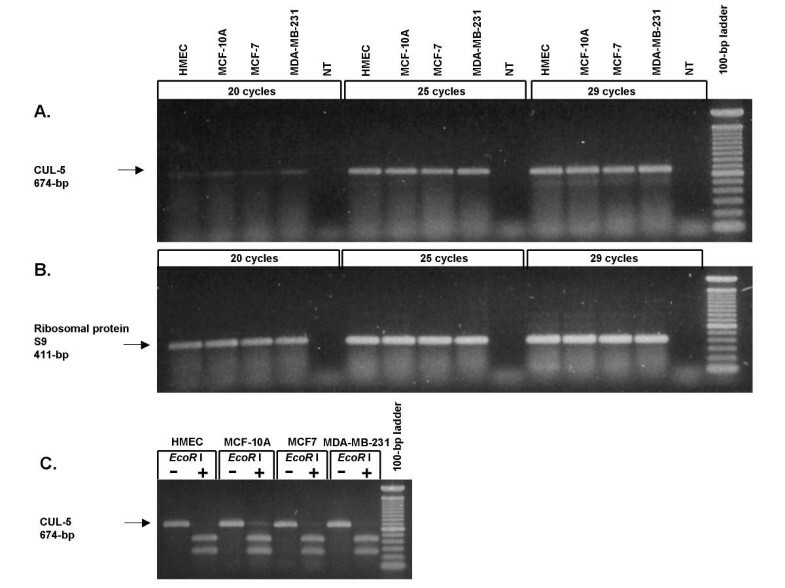 To examine expression of CUL-5 protein, Western blots were performed using affinity-purified rabbit polyclonal antiserum generated in rabbits immunized with a synthetic CUL-5 peptide. 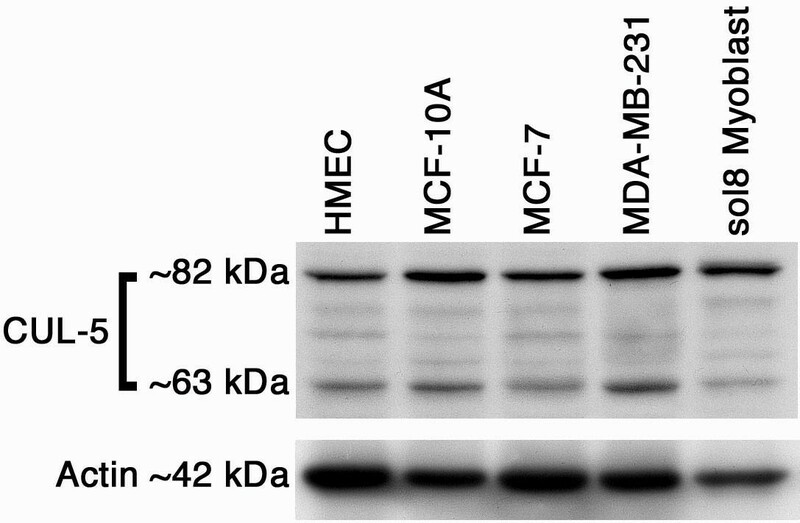 Western blot analysis revealed a major immunoreactive band of Mr ~ 82 kDa, and a minor band of M r ~ 63 kDa (Figure 4). These bands were not seen when antibody was preincubated with immunizing peptide or when preimmune serum was used (data not shown). Blots were stripped and reprobed with anti-actin antibody to ensure the integrity of the protein samples and the Western blotting procedure (Figure 4). RT-PCR analysis for CUL-5 in HMEC, MCF-10A, MCF-7, and MDA-MB-231 cells. Semiquantitative RT-PCR was performed using 1 μg of total RNA with 20, 25, and 29 cycles of PCR using primers for (A) CUL-5, or (B) ribosomal protein S9; (C) The CUL-5 PCR products from HMEC, MCF-10A, MCF-7, and MDA-MB-231 cells were confirmed by restriction endonuclease digestion with EcoR I. The results shown are representative of triplicate experiments using independent RNA samples. RT-PCR analysis for CUL-1 , -2 , -3 , -4A , -4B , -5 , and ribosomal protein S9 in HMEC, MCF-10A, MCF-7, and MDA-MB-231 cells. RT-PCR was performed using 1 μg of total RNA and 25 cycles of PCR. For all of the cells examined, a 560-bp cDNA for CUL-1, a 358-bp cDNA for CUL-2, a 613-bp cDNA for CUL-3, a 512-bp cDNA for CUL-4A, a 593-bp cDNA for CUL-4B, a 674-bp cDNA for CUL-5, and a 411-bp cDNA for ribosomal protein S9 were amplified by RT-PCR. The results shown are representative of duplicate experiments using independent RNA samples. Northern blot analysis for CUL-5 in HMEC, MCF-10A, MCF-7, and MDA-MB-231 cells. Approximately 10 μg of total RNA from HMEC, MCF-10A, MCF-7, MDA-MB-231 was electrophoresed and transferred to a Nytran® supercharge membrane. The blots were hybridized with a 32P-labeled 674-bp CUL-5 cDNA or a 905-bp GAPDH cDNA. The results shown are from a 4-day exposure to x-ray film for CUL-5 and a 5-hr exposure to x-ray film for GAPDH. A major CUL-5 transcript of ~7.4 kb was present in all of the cells examined. The results shown are representative of triplicate experiments using independent RNA samples. Western blot analysis for CUL-5 in HMEC, MCF-10A, MCF-7, MDA-MB-231, and sol8 mouse myoblast cells. Approximately 50 μg of protein from each cell type, and 25 μg of protein from sol8 mouse myoblasts was fractionated by SDS-PAGE. The primary antibody was affinity purified anti-CUL-5 (378–393) at ~1.14 μg/ml for 1 hr at room temperature. The secondary antibody was an Immunopure® peroxidase goat anti-rabbit IgG (1:40,000, 1 hr at room temperature). The blots were visualized using the Supersignal® west pico chemiluminescent substrate and exposure to x-ray film. Blots were stripped and reprobed with rabbit polyclonal anti-actin (1:1,000, Sigma) to evaluate loading differences and the integrity of the Western blotting procedure. Duplicate experiments yielded similar results. A normal human tissue expression array was incubated with a radiolabeled CUL-5 cDNA probe to determine CUL-5 mRNA expression in adult and fetal human tissues. CUL-5 mRNA is expressed in a wide range of human tissues (Table 2). Using a PhosphorImager to quantify the data the highest relative expression of CUL-5 was found in skeletal muscle (volume = 163430, coordinate 7B of Table 2) and the lowest relative expression was found in ovarian tissue (volume = 11139, coordinate 8G of Table 2). CUL-5 mRNA was also detected in fetal human tissue samples and in human cancer cell lines (Table 2). The integrity of the samples on the array was confirmed by reprobing the blot with a radiolabeled ubiquitin cDNA (data not shown). CUL-5 mRNA was not detected in negative controls, including yeast total RNA, yeast tRNA, E. coli rRNA, E. coli DNA, poly r(A) and Cot-1 DNA; these samples were used to obtain an average background correction value. Minimal hybridization did occur with the human genomic DNA samples on the array, which may represent the 674-bp cDNA hybridizing with the CUL-5 gene. Analysis of CUL-5 expression in normal human tissues and cancer cell lines using a multiple human tissue expression array. The array was hybridized with the 32P-labeled (2 × 107 cpm) 674-bp CUL-5 cDNA for 20 hrs. Analysis of the array was performed using a PhosphorImager and ImageQuant software. 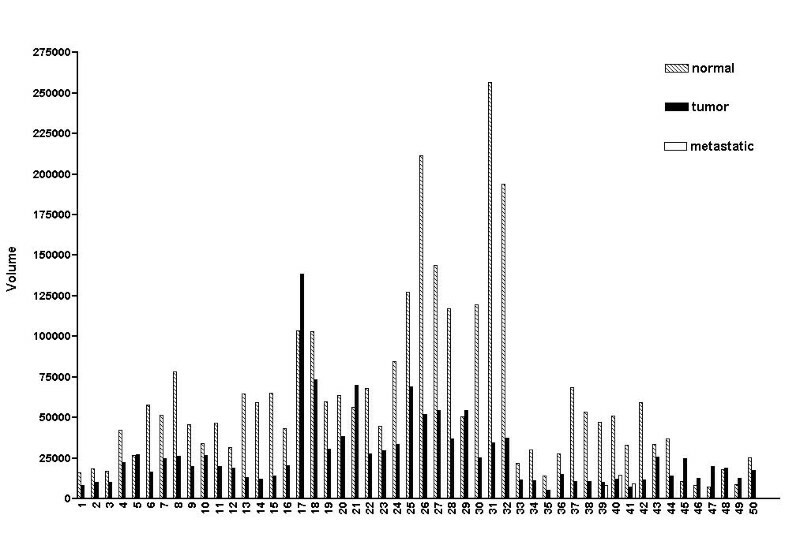 The background-adjusted volumes for each sample are reported for the 2-day exposure of the array to a phosphor-screen. A cancer profiling array was used to examine CUL-5 expression in matched normal tissues versus tumor tissues. With the 50 cases of breast tissue examined, 41 cases (82%) demonstrated a decrease in CUL-5 expression in the breast tumor tissue versus the matched normal tissue (see Table 3, Figures 5, 6 and 7). In three breast tumor cases with matched metastatic samples, CUL-5 expression was similar in the tumor tissues versus the matched metastatic tissues (Figure 7). With the 50 cases of breast tissue there was a statistically significant (P < 0.0001) ~2.2 fold average decrease in CUL-5 expression in the tumor tissue versus the matched normal tissue (Figure 8). The largest difference was seen in sample #31 on the array with a ~7.4 fold decrease in CUL-5 expression in the tumor tissue versus the normal tissue (Table 3 and Figure 7). On the cancer profiling array three other tissues demonstrated statistically significant decreases in CUL-5 expression in tumor tissue versus the matched normal tissue (Figure 8). These tissues included uterine (~1.5 fold decrease, P = 0.0021, n = 42), colon (~1.4 fold decrease, P = 0.0012, n = 35), and kidney (~1.5 fold decrease, P = 0.0034, n = 20). This trend was also observed in ovarian matched normal and tumor tissues, but was not significant (P = 0.0565, n = 14). Conversely, prostate tissue exhibited a ~1.5 fold increase in CUL-5 mRNA in tumor tissue versus normal tissue (P = 0.0335, n = 4). The integrity of the samples on the cancer profiling array was confirmed by reprobing the array with a radiolabeled ubiquitin cDNA (data not shown). As with the normal human tissue expression array, the CUL-5 674-bp cDNA probe did not hybridize with yeast total RNA, yeast tRNA, E. coli rRNA, E. coli DNA, poly r(A) and Cot-1 DNA. Clinical information and fold-change in CUL-5 expression for the 50 cases of matched normal tissue and breast tumor tissue. The fold-increase (↑) or fold-decrease (↓) in CUL-5 expression in the tumor tissue compared to the matched normal tissue is shown for each individual matched pair. Location of samples on the cancer profiling array. Information concerning the patient samples on this array is available at http://bioinfo.clontech.com/dparray (N = normal tissue; T = tumor tissue; a box indicates a matched normal/tumor pair with an associated metastatic sample). Expression of CUL-5 in normal tissues versus matched tumor tissues. The cancer profiling array was hybribized with the 32P-labeled (2 × 107 cpm) 674-bp CUL-5 cDNA for 20 hrs. The results shown represent the 2-day exposure to the phosphor screen. The location of individual samples on the array is shown in Figure 5. Expression of CUL-5 in the 50 cases of matched normal breast tissue and breast tumor tissue. The data in this figure was derived from quantification of the data in Figure 6 using a PhosphorImager and ImageQuant software, and the background adjusted volumes are shown for each sample. 41 of the 50 cases of breast tissue (82%) exhibited a decrease in CUL-5 expression in the tumor tissue versus the matched normal tissue. Three of the 50 cases had a matched metastatic sample (cases 39, 40, and 41), and the level of CUL-5 expression in the metastatic samples was similar to that seen in the associated tumor tissues. Expression of CUL-5 in matched normal tissue versus tumor tissue. The data in this figure was derived by quantification of the data in Figure 6 using a PhosphorImager and ImageQuant software. The mean volumes ± the SEM are shown. An asterisk indicates a statistically significant difference between the matched normal versus tumor tissue as determined by two-way paired t-tests (P ≤ 0.05). A statistically significant decrease in CUL-5 expression was found in breast tumor tissue (~2.2 fold decrease, P < 0.0001, n = 50), uterine tumor tissue (~1.5 fold decrease, P = 0.0021, n = 42), colon tumor tissue (~1.4 fold decrease, P = 0.0012, n = 35), and kidney tumor tissue (~1.5 fold decrease, P = 0.0034, n = 20), compared to matched normal tissues. A significant increase in CUL-5 expression was found in prostate tumor tissue compared to matched normal tissue (~1.5 fold increase, P = 0.0335, n = 4). The CUL-5 gene is of interest in relation to breast tumorigenesis as a putative tumor suppressor, since it is located on a region of chromosome 11 that is associated with LOH in breast cancer [1–8]. However, there is a lack of information concerning the expression of CUL-5 in breast epithelial cells compared with breast cancer cells and in normal tissues compared with tumor tissues. To address this issue, we used RT-PCR, Northern blot analysis and Western blot analysis to analyze CUL-5 mRNA and protein expression. With these techniques, we demonstrated a major CUL-5 transcript of ~7.4 kb and a major immunoreactive protein of M r ~ 82 kDa in primary HMECs, immortalized but non-tumorigenic MCF-10A breast epithelial cells, ER-α positive MCF-7 breast cancer cells, and ER-α negative MDA-MB-231 breast cancer cells, which is consistent with previous reports [7, 17–19]. While CUL-5 expression was unchanged in breast cancer cells versus breast epithelial cells, the cells used for these studies came from unsynchronized subconfluent proliferating cultures, and cell cycle dependent expression of some CUL family members has been described [19, 20]. Investigation of cell cycle dependent expression of CUL-5 is crucial to gain insight into both the mechanism(s) regulating the expression and potential cellular function(s) of CUL-5. The multiple human tissue expression array demonstrated CUL-5 mRNA expression in many fetal and adult tissues. Ubiquitous expression of CULs is expected, given that CUL-1, -3 and -4A are all critical for proper development; mice nullizygous for these CUL proteins fail to develop past E5.5, E7.5, and E7.5, respectively [21–23]. The finding of CUL-5 expression in various fetal human tissues suggests that CUL-5 may also play a role in embryogenesis and development. CUL-5 was expressed in adult tissues associated with proliferation (e.g. gastrointestinal tract), and in adult tissues not associated with a high level of proliferation (e.g. brain). Ubiquitous tissue expression of CUL-5 mRNA is supported by RT-PCR and Northern blot studies in various human, rat and rabbit tissues [7, 17, 18, 24]. The high level of CUL-5 mRNA expression found in skeletal muscle is consistent with similar findings by others [7, 18], and suggests that CUL-5 may play an important role in this tissue. CUL-5 protein expression was originally reported to be restricted to medullary collecting tubule cells and endothelial cells as determined by immunohistochemistry . However, our work indicates that several cultured cell types, including breast epithelial cells, breast cancer cell lines of epithelial origin, and mouse sol8 myoblast cells all express CUL-5 protein. CUL-5 has also recently been show to be ubiquitously expressed in the rat brain by immunocytochemistry . The broad nature of CUL-5 expression suggests that CUL-5 may have a fundamental role in cellular differentiation and proliferation. We evaluated 50 cases of breast tumor tissue and matched normal tissue, and found a significant ~2.2 fold decreased expression of CUL-5 in tumor tissues compared to normal tissues. Patient samples on this cancer profiling array support the hypothesis that decreased expression of CUL-5 may be associated with breast tumorigenesis. This decrease is remarkable, since a 2 fold reduction in CUL-4A expression can result in embryonic death in mice , and less than 2 fold increased expression of CUL-4A prevents granulocytic differentiation and promotes proliferation . The cause of the decreased CUL-5 expression in breast tumor tissue remains unknown, but may reflect both genetic and epigenetic events, and warrants further investigation. Another potential tumor suppressor gene in breast cancer that is also located on chromosome 11 q22-23 is the ATM gene, which is normally important for DNA damage cell cycle checkpoint control . Similar to our results for CUL-5 expression in MCF-7 and MDA-MB-231 cells, these cells do not express decreased levels of ATM mRNA . In contrast to our results obtained for CUL-5 expression in breast tissue, one study reported that of 11 cases of matched normal breast and cancerous tissue, seven cases had higher expression of ATM mRNA associated with the cancer, three cases expressed similar levels in the normal tissue versus the cancer, and only one case had decreased expression in the cancer . The role of the ATM gene in breast cancer is controversial since mutations in the ATM gene have not been clearly linked to development of breast cancer [29, 30]. In addition to differential CUL-5 expression in breast tumor tissue, a statistically significant decrease in CUL-5 expression was found in uterine tumor tissue, colon tumor tissue, and kidney tumor tissue compared to matched normal tissues. A similar trend was seen with ovarian tumor tissue compared to matched normal tissue, although the difference was not statistically significant. An increase in CUL-5 expression was seen in prostate tumor tissue compared to matched normal tissue. Differential expression of CUL-5 in other human tumors suggests that dysregulation of CUL-5 expression may occur during tumorigenesis in these tissues as well. A recent study demonstrated a ~1.5 fold increase in CUL-5 expression in lung adenocarcinoma versus unmatched control lung tissue . Of the 21 matched lung samples on the cancer profiling array used for this study there were seven matched cases with the diagnosis of adenocarcinoma (Figure 5, 27B/28B, 27I/28I, 27J/28J, 27L/28L, 27N/28N, 27O/28O, 27P/28P). The mean volume ± SEM for CUL-5 expression for the normal tissue and matched tumor tissue for these seven cases is 19230 ± 3352 and 22520 ± 6115, respectively. Therefore, The data for lung adenocarcinoma demonstrate a similar trend for higher expression of CUL-5 in the tumor tissue versus normal tissue, although the ~1.2 fold difference was not statistically significant (P = 0.4574, n = 7). The functional significance of altered CUL-5 expression in cancer is currently not known. CUL-5 was originally described as a gene product involved in vasopressin-mediated increases of intracellular-free calcium , and was subsequently shown to attenuate cAMP production in cultured cells . Recently, it was reported that overexpression of CUL-5 in CHO and cos 1 cells attenuates proliferation with an associated decrease in MAPK phosphorylation and an increase in p53 . It is not clear if these reported effects of CUL-5 on cellular signaling and proliferation are E3 ubiquitin ligase dependent or independent. CUL-5 belongs to the CUL protein family, and CULs have diverse roles in development, cell cycle regulation, and transcriptional regulation through their actions as components of E3 ubiquitin ligase complexes [15, 16, 34]. Loss of function mutations in CUL-1 cause generalized tissue hyperplasia in C. elegans . CUL-1 is a component of an E3 ubiquitin ligase complex called the SCF , in which S stands for the adaptor protein SKP-1, C stands for the yeast CUL CDC53, and F stands for a substrate recognition F-box protein. CUL-1 containing E3 ubiquitin ligase complexes are implicated in ubiquitinating a wide range of target proteins such as cyclins E and D, E2f-1, p21, p27, β-catenin and IκB [21, 36–49]. CUL-2, -3, -4A and -5 do not associate with the adaptor protein SKP-1, but all of these CULs appear to function as components of E3 ubiquitin ligases, suggesting that they use other adaptor protein(s) besides SKP-1 [50–53]. In support of this idea, CUL-2 forms an E3 ubiquitin ligase complex with the Ring finger protein ROC1/Rbx1, the adaptor Elongin BC, and a BC-box motif containing substrate recognition protein such as the VHL tumor suppressor or mMED8 [34, 54–56]. The VHL/Elongin BC/CUL-2/ROC1 E3 ubiquitin ligase complex regulates transcriptional activity of hypoxia-inducible genes by targeting the α subunit of hypoxia-inducible transcription factors for ubiquitin-mediated degradation during non-hypoxic conditions [57–63]. In C. elegans, CUL-2 is critical during G1-S phase transitions, since CUL-2 mutant germ cells exhibit G1-phase arrest with accumulation of CKI-1, a cyclin dependent kinase inhibitor . The CUL-2 mutant C. elegan embryos also exhibited mitotic chromosomes that were unable to condense . Expression of CUL-3 is increased in cultured colon cancer cells versus normal colon cells, and CUL-3 containing E3 ubiquitin ligase complexes are implicated in ubiquitinating cyclins D and E [22, 49, 65]. The CUL-4A gene is located on an amplicon in breast cancer and was found to be amplified in 16% of the cases of primary breast cancer examined and the mRNA was overexpressed in 47% of breast cancers examined . Research indicates that CUL-4A is involved in cell cycle control, degradation of the DNA repair protein DDB2, embryonic development and hematopoiesis [23, 26, 67–70]. The recently described CUL-7 which has been shown to play a role in vascular morphogenesis, forms an SCF E3 ubiquitin ligase by interacting with the adaptor SKP-1, the RING finger protein ROC1, and the F-box protein fbx29 [12, 13]. Recent studies demonstrate that CUL-5 is capable of forming E3 ubiquitin ligase complexes with elongin BC, as is the case with CUL-2 . The CUL-5/Elongin BC complex was shown to interact with a number of BC-box motif containing proteins, such as MUF1, VHL, RNA polymerase II elongation factor Elongin A, and suppressor of cytokine signaling proteins (e.g. SOCS1 and WSB-1) . It is of interest that CUL-5 was recently shown to be involved in MDM2-independent and adenovirus-dependent ubiquitin-mediated degradation of p53 [71, 72]. Despite growing evidence of functional roles of CUL family members, CUL-5 remains largely uncharacterized, including its possible involvement in breast tumorigenesis. Future plans include examination of CUL-5 protein expression in breast cancer biopsy specimens by immunohistochemistry. Also, to elucidate the cellular role(s) of CUL-5 in breast tumorigenesis, experiments are planned to modulate CUL-5 expression and to identify CUL-5 interacting proteins from breast epithelial cells and breast cancer cells. Breast epithelial cells (HMEC, MCF-10A) and breast cancer cells (MCF-7, MDA-MB-231) all express CUL-5 mRNA and protein without an apparent decrease in CUL-5 expression in the breast cancer cells versus the breast epithelial cells. CUL-5 mRNA is ubiquitously expressed in human tissues, which is indicative of an important fundamental cellular role for CUL-5. Examination of 50 individual cases of matched breast tumor tissue and normal tissue revealed a 2.2 fold decrease in the expression of CUL-5 in the tumor tissue versus the matched normal tissue, thus supporting a potential role for dysregulation of CUL-5 expression in breast tumorigenesis. Primary human mammary epithelial cells (HMEC) were obtained from Clonetics (Walkersville, MD) and maintained using medium and instructions provided by the manufacturer. The MCF-10A breast epithelial cells, which are immortalized, but nontumorigenic [73, 74], were obtained from the ATCC (Manassas, VA; CRL-10317) and maintained in Ham's F12:Dulbecco's modified Eagle's medium (1:1, Sigma, St. Louis, MO) supplemented with 20 ng/ml epidermal growth factor (Gibco Invitrogen Corp., Carlsbad, CA), 100 ng/ml cholera toxin (Sigma), 0.01 mg/ml insulin (Sigma) 500 ng/ml hydrocortisone (Sigma) and 5% horse serum (Gibco Invitrogen Corp.). The ER-α positive MCF-7 breast cancer cell line  and the ER-α negative MDA-MB-231 breast cancer cell line  were obtained from the ATCC (HTB-22 and HTB-26, respectively) and maintained in Dulbecco's modified Eagle's medium containing 10% iron-supplemented calf serum (Hyclone, Logan, UT). All cells were maintained at 37°C in a humidified environment with 5% CO2/95% air. Total RNA was isolated from subconfluent proliferating cultures using TRI REAGENT® according to the instructions provided by the manufacturer (MRC, Cincinnati, OH). RT-PCR was performed using ~1 μg of total RNA for each sample and the One-Step Superscript™ kit from Invitrogen. The reaction volumes were 50 μl and contained SUPERSCRIPT™ II reverse transcriptase/Platinum® Taq DNA polymerase (1 μl), dNTPs (0.2 mM of each), magnesium sulfate (1.2 mM) and gene specific sense/antisense primers (0.2 μM) at concentrations that were recommended by the manufacturer. The primers used for RT-PCR of CUL-5 and other CUL family members are shown in Table 1, and were designed using LASERGENE software (DNASTAR, Inc., Madison, WI). The RT-PCR conditions consisted of 30 min at 50°C, 2 min at 94°C, followed by a denaturation step of 30 sec at 94°C, an annealing step of 1 min (see Table 1 for annealing temperatures), an extension step of 1 min at 72°C, and a final extension step of 10 min at 72°C. Semiquantitative RT-PCR was performed for CUL-5, using 20, 25, and 29 cycles, utilizing a technique similar to that previously described . The RT-PCR analyses for CUL-5 expression were performed in triplicate with independent RNA samples. The CUL-5 RT-PCR products from HMEC, MCF-10A, MCF-7, and MDA-MB-231 were cloned using the TOPO TA Cloning® kit (Invitrogen) and confirmed by DNA sequencing using an ABI Model 3700 sequencer. The CUL-5 PCR products from HMEC, MCF-10A, MCF-7, and MDA-MB-231 were also confirmed by restriction endonuclease digestion with EcoR I (see Table I). The CUL-1, -2, -3, -4A and -4B PCR analyses were performed in duplicate using independent RNA samples and 25 cycles of PCR. The CUL-1, -2, -3, -4A, and -4B PCR products were validated by restriction endonuclease digestion with Bgl II, Aat II, EcoR I, Sau3A I, and Hae III, respectively (see Table I). The NT negative control samples received molecular biology grade water instead of RNA, and the minus reverse transcriptase samples received 2 units of Platinum® Taq DNA polymerase without the SUPERSCRIPT™ II reverse transcriptase. Integrity of the RNA samples was confirmed by amplifying a 411-bp PCR product for ribosomal protein S9. Approximately 10 μg of total RNA from HMEC, MCF-10A, MCF-7, MDA-MB-231 cells, or 5 μg of RNA ladder (0.24–9.5 Kb, Invitrogen) was electrophoresed for 3.5 – 4 hrs at 70 volts using a 1% agarose gel containing 0.66 M formaldehyde and 1X MOPS. After electrophoresis, gels were washed 3 × 5 min with DEPC-treated water and the RNA was transferred overnight by capillary transfer to a Nytran® supercharge membrane (Schleicher & Schuell, Keene, NH) using 20X SSC (Ambion, Austin, TX) and the Turboblotter™ rapid downward transfer system (Schleicher & Schuell). Following the transfer, RNA was immobilized to the membrane by UV irradiation using a model 1800 UV-Stratalinker (Statagene, La Jolla, CA) and by baking for 2 hrs at 70°C. Membranes were stained with blot stain blue (Sigma), according to the procedure provided by the manufacturer, to visualize the RNA ladder. Membranes were then prehybridized with ULTRAhyb™ hybridization buffer (Ambion) for 0.5 – 1 hr at 42°C. The CUL-5 cDNA probe used for Northern blot was prepared by RT-PCR using RNA from HMEC and the primer pairs described in Table 1. The CUL-5 PCR product was purified using the QIAquick® PCR purification kit (QIAGEN, Valencia, CA) and the DNA concentration determined by measuring the absorbance at 260 nm. The purified DNA (~25 ng) was radiolabeled using deoxycitidine 5'-triphosphate [α-32P] (3000 Ci/mmol, Perkin Elmer Life Sciences, Boston, MA) and the DECAprime™ II DNA labeling kit (Ambion), according to the instructions provided by the manufacturer. The radiolabeled probe was separated from the unincorporated nucleotides using NucTrap® probe purification columns (Stratagene). The radiolabeled DNA was denatured prior to hybridization by adding 0.1 volumes of 1 N NaOH and incubating for 10 min at 37°C. After prehybidization, the membranes were hybridized for 18 hrs at 42°C with ~107cpm of denatured radiolabeled probe in ULTRAhyb (Ambion). Following hybridization, the membranes were washed 2 × 5 min with 2X SSC/0.1% SDS at 42°C, followed by 2 × 15 min washes with 0.1X SSC/0.1% SDS at 42°C. Membranes were then exposed to a Molecular Dynamics phosphor screen (Amersham Pharmacia Biotech, Piscataway, NJ) or to x-ray film for documentation. To account for loading and transfer differences, the membranes were stripped by washing 2 × 15 min at 99°C with 0.1X SSC/0.5% SDS, and reprobed using a radiolabeled 905-bp mouse GAPDH cDNA (Ambion). Northern blots were performed in triplicate using independent RNA samples. Protein samples were prepared from approximately 107 subconfluent proliferating HMEC, MCF-10A, MCF-7, and MDA-MB-231 cells using M-Per™ mammalian protein extraction reagent (Pierce, Rockford, IL) containing a complete™ mini protease inhibitor cocktail tablet (Roche Molecular Biochemicals, Indianapolis, IN), according to the instructions provided by the manufacturers. Protein concentrations were determined using the BCA™ protein assay kit (Pierce) and ~50 μg of each sample was diluted using 2X SDS sample buffer (0.125 M Tris-Cl/0.1% SDS, pH 6.8, 20% glycerol, 4% SDS, 0.2% 2-mercaptoehtanol, 0.001% bromphenol blue), and the samples were boiled for 5 min. Samples were electrophoresed using SDS-PAGE (10% acrylamide separating gel, 3.9% acrylamide stacking gel) according to the method of Laemmli . Proteins were transferred at 4°C to a PVDF-Plus membrane (MSI, Westboro, MA) at 14 volts for 18 hrs. A synthetic peptide consisting of amino acids 378–393 (NDATIFKLELPLKQKG) of human CUL-5, containing a COOH-terminal cysteine, made as an amide, was produced and conjugated to ovalbumin (BioSource International, Hopkinton, MA). Rabbit polyclonal antiserum was generated against this synthetic peptide and was immunopurified using a thiol coupling gel. The blots were blocked for 1 hr at room temperature using Superblock® (Pierce, Rockford, IL), and incubated with affinity-purified anti-CUL-5 (378–393) for 1 hr at room temperature at a dilution of 1:1,000 (~1.14 μg/ml) in antibody dilution buffer (10% Superblock®/90% 10 mM Tris, pH 7.5, 100 mM NaCl, and 0.1% Tween® 20). The blots were then washed 6 × 5 min with wash buffer (10 mM Tris pH 7.5, 100 mM NaCl, and 0.1% Tween® 20). After washing, the blots received a secondary antibody for 1 hr at room temperature, that was either Immunopure® peroxidase conjugated goat anti-rabbit IgG (1:40,000, Pierce) or a Cruz marker compatible peroxidase conjugated goat anti-rabbit IgG (1:5,000, Santa Cruz Biotechnology, Inc., Santa Cruz, CA) prepared in antibody dilution buffer. The blots were then washed as previously described and exposed to Supersignal® west pico chemiluminescent substrate (Pierce). The Western blots were visualized by exposure to x-ray film. As a negative control, IgG was purified from preimmune serum using a NAb™ protein A spin chromatography kit (Pierce), and ~1.14 μg/ml of the IgG purified preimmune serum was used as the primary antibody. An additional control for the Western blots involved adding a 200 molar excess of the immunizing peptide to the anti-CUL-5 (378–393) antiserum for 30 min at room temperature prior to blotting. A cellular lysate from sol8 mouse myoblast cells (Santa Cruz Biotechnology, Inc.) was used as a positive control in the Western blots, since skeletal muscle was found to express the highest levels of CUL-5 mRNA (see Table 2). To control for sample loading differences and the integrity of the Western blotting procedure, the blots were stripped using 0.2 N NaOH and reprobed using a rabbit polyclonal antibody (1:1,000, Sigma) that recognizes actin (~42 kDa). The human multiple tissue expression array was obtained from Clontech (Palo Alto, CA). This array contains poly A+ RNA from 61 adult tissues, 7 fetal tissues, and 8 cancer cell lines. The samples on the multiple tissue expression array are normalized using 8 different housekeeping genes [79–81]. The multiple tissue expression array was prehybridized for 30 min at 65°C in 10 ml of ExpressHyb (Clontech) containing 1 mg of sheared salmon testes DNA. The radiolabeled CUL-5 probe was prepared as described for Northern blot analysis, and 2 × 107 cpm of the probe was mixed with 30 μg of C0t-1 DNA, 150 μg of sheared salmon testes DNA, and 50 μl of 20X SSC, and the mixture was heated at 95°C for 5 min followed by 68°C for 30 min. The array was then hybridized with radiolabeled probe for 20 hrs at 65°C in 5 ml of ExpressHyb. The array was washed 5 × 20 min at 65°C with 2X SSC/0.1% SDS, and 2 × 20 min at 55°C with 0.1X SSC/0.5 % SDS. The array was exposed to a phosphor screen for 1, 2, and 3 days and to x-ray film for 3 and 4 days. 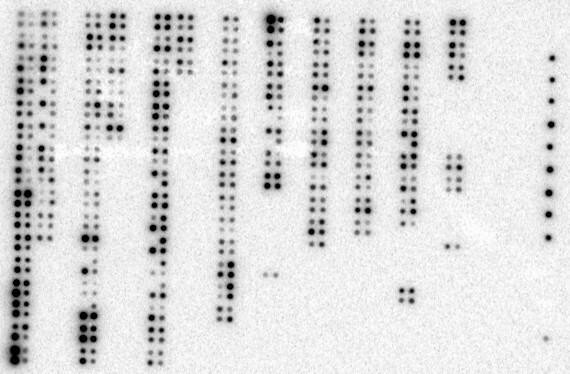 The array was stripped using boiling 0.5% SDS and reprobed for 20 hrs using a radiolabeled human ubiquitin cDNA (1 × 107 cpm), to ensure the integrity of the samples on the array. The cancer profiling array contains SMART™ cDNA synthesized from CLONTECH's premium RNA™ from 241 cases of matched normal and tumor tissue from individual patients . Information concerning the patient samples on this array can be obtained at http://bioinfo.clontech.com/dparray. 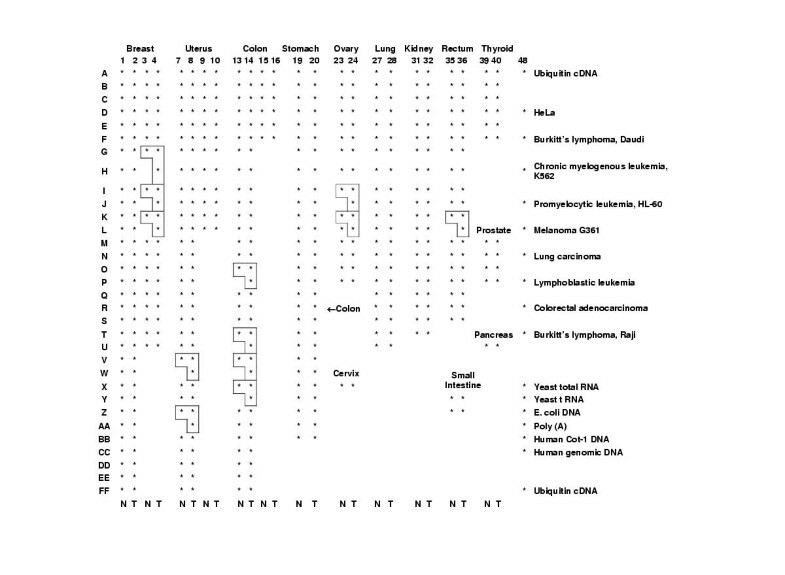 Information concerning the 50 cases of matched breast tissue is located in Table 3, and the location of samples on the array is shown in Figure 5. The matched samples on the cancer profiling array are normalized using four different housekeeping genes. The cancer profiling array was analyzed using a technique similar to that described for the multiple tissue expression array, except that the array was washed 4 × 30 min at 65°C with 2X SSC/0.5% SDS, followed by 1 × 30 min at 65°C with 0.2X SSC/0.5% SDS, with a final 5 min wash using 2X SSC. The cancer-profiling array was exposed to a phosphor-screen for 1, 2, and 3 days and to x-ray film for 3 and 4 days. The cancer profiling array was stripped and reprobed using radiolabeled human ubiquitin cDNA to ensure the integrity of the samples on the array. Both arrays were analyzed using a Molecular Dynamics STORM 860 PhosphorImager and ImageQuant software. Analysis of the arrays consisted of drawing individual boxes or grids around the hybridization signal for each sample and subtracting an average background value adjusted to the area of the box or grid for each individual sample. The 2-day exposure for both arrays was used for quantification of CUL-5 expression with the PhosphorImager, since the sample signals were in the linear range. Statistical analysis of the cancer-profiling array was performed using GraphPad prism 2.01 software (GraphPad Software, inc., San Diego, CA) and two-tailed paired t-tests (P ≤ 0.05). This research was supported in part by grant number R15 CA85279 from the NIH, awarded to Michael J. Fay. Amyna Husain and David Shoipe received summer research stipends from the Office of Research Affairs and Sponsored Programs at Midwestern University. Kenneth Pherson received a summer research stipend from the Greater Chicagoland Arthritis Foundation. The authors are thankful to Victoria Sears and Dana Fay for assistance with the preparation of figures and to Drs. Walter Prozialeck and Nalini Chandar for reviewing the manuscript prior to submission. MJF was responsible for designing and implementing all experiments and manuscript preparation. KAL assisted with DNA sequencing and manuscript editing. GAK was responsible for maintaining cell cultures and assisted with RT-PCR, Northern blot analysis, Western blot analysis and the expression arrays. DMS assisted with RT-PCR, restriction endonuclease confirmation of PCR products, and the expression arrays. CJM assisted with the expression arrays. AH, JRL, KP and AH assisted with RT-PCR, Northern blot analysis and restriction endonuclease confirmation of PCR products. All authors read and approved the final manuscript.